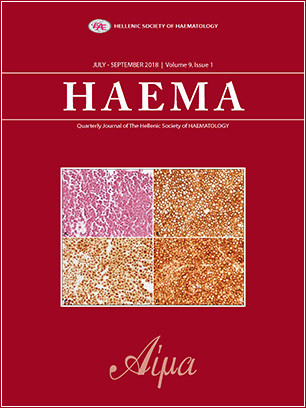 Haema is the official journal of the Hellenic Society of Haematology (HSH) publishing original articles, reviews and case reports in all areas of Haematology. The first issue of Haema was published in Greek in 1998 and past editors were Prof N. Zoumbos, Prof G.Meletis and Prof PH. Beris . In its current form , Haema is launched as an open Access journal published quarterly in English. All accepted articles are published free of any charge, including high definition figures, photos and color morphology images. Our aim is to create an Open Access International journal that covers basic, clinical/translational research as well as issues of cost versus benefit of the new targeted therapies and the emerging new companion diagnostics in Haematology. A rapid final response, within 4 weeks to every submitted work is the policy of Haema. A special section in Haema is correspondence , where scientific opinions from Haematologists, can be published , after evaluation and approval by the editorial board of Haema. I cordially invite you to submit your work in Haema! HAEMA is aimed at both clinicians and researchers, providing an invaluable link between the various biomedical fields involved in hematology. HAEMA covers the development and significant advances in both research and clinical practice in a wide range of hematological topics, including hematopoiesis, red cell disorders, hematological malignancies, hemopoietic stem cell transplantation, blood coagulation, and transfusion medicine. HAEMA is also dedicated to education in the form of reviews, commentaries, conference summaries and images in hematology.